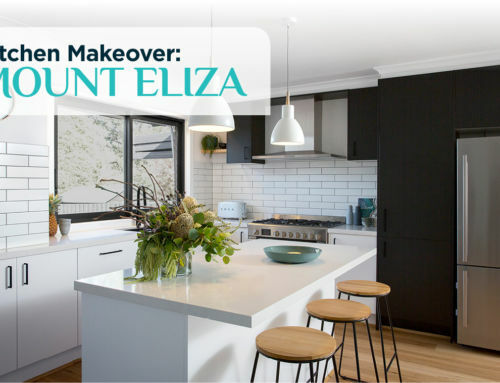 Loving the Kinsman Kitchens renovation makeovers featured on Love it Or List It Australia? So are we! 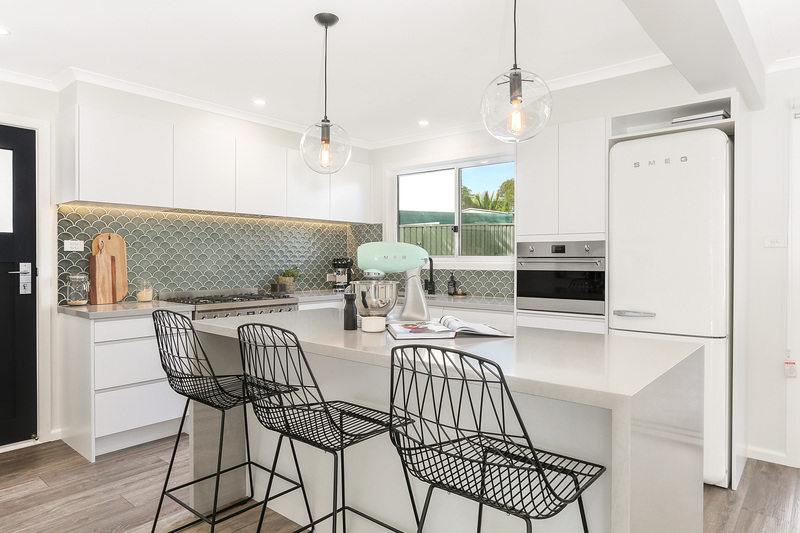 In each episode, co-hosts Neale Whitaker and Andrew Winter have presented the home owners with the dilemma of whether to stay and enjoy life in their newly renovated home, or whether to sell and move on. 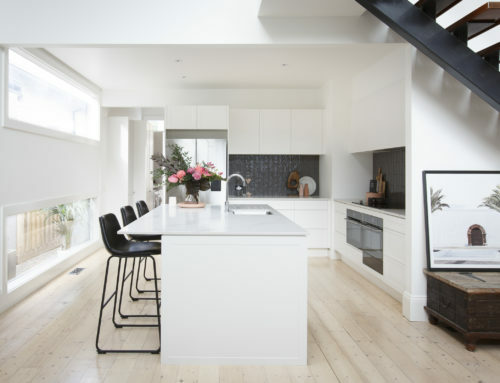 Below we take a closer look at the kitchen designs that have contributed to making the decision of whether to ‘love it’ or ‘list it’ such a difficult choice! 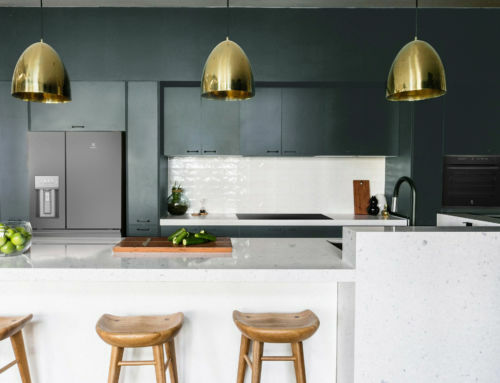 And if you’d like to WIN a Kinsman Kitchen makeover of your own valued at $20,000, don’t miss out on entering the competition on Lifestyle– click here to enter. For many, a house by the sea is their dream home. And a kitchen with water views – well, that makes for a dream kitchen. In this contemporary coastal kitchen in Newport, NSW, the owners enjoy blue views over the marina, and Neale Whitaker’s kitchen renovation has maximised the outlook by opening up the windows into a servery. 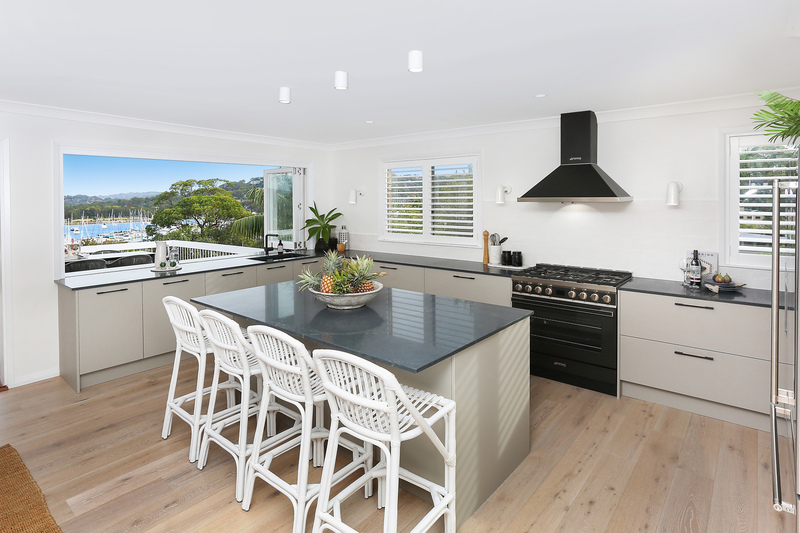 The sophisticated tone of the Kinsman ‘Essendon Bespoke’ Super Matt cabinetry with Black Anodised Bar Handle complements the timber flooring, while the Silestone Charcoal Soapstone island benchtop provides breaky with a view for 4 people – the dream Aussie lifestyle.  Unsurprisingly, the owners of this newly renovated kitchen loved it and decided to stay – well played Neale! You can’t go wrong with a crisp white kitchen which will never go out of style. The key with an all-white kitchen is to add elements of interest, to avoid it looking too boring and basic. 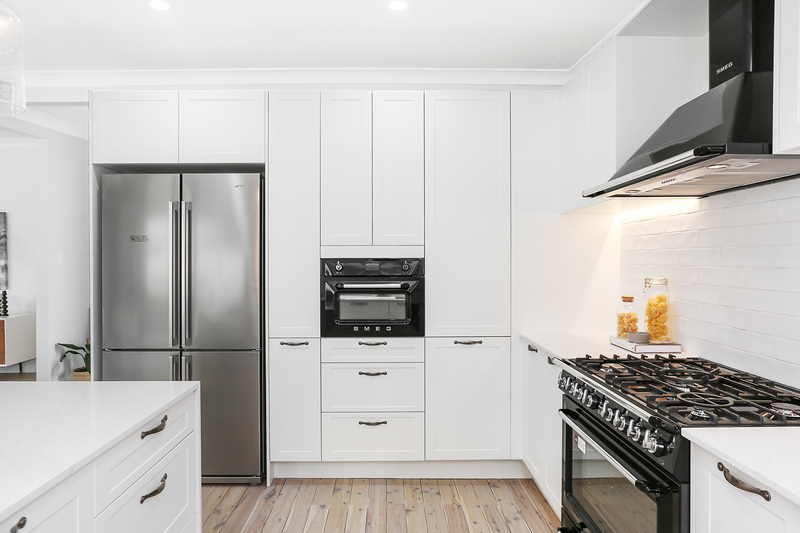 In this kitchen located in Picnic Point, NSW, the cabinetry, benchtops and splashback are all white, making it light and bright, and the use of touch-catch mechanisms rather than handles on the overhead cabinets keeps this smaller space looking clean and uncluttered. 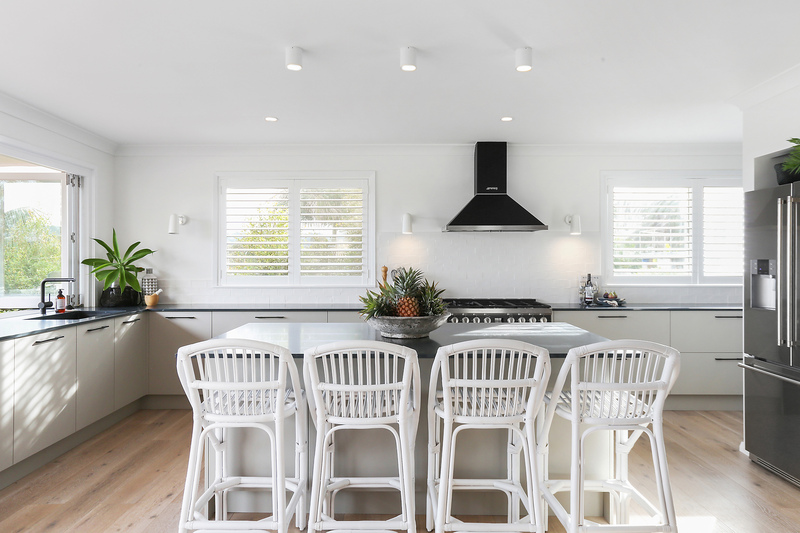 Decorative interest has been added via the glass pendant lighting, plus timber breakfast bar stools which combine to create a sense of simplified Hamptons style. 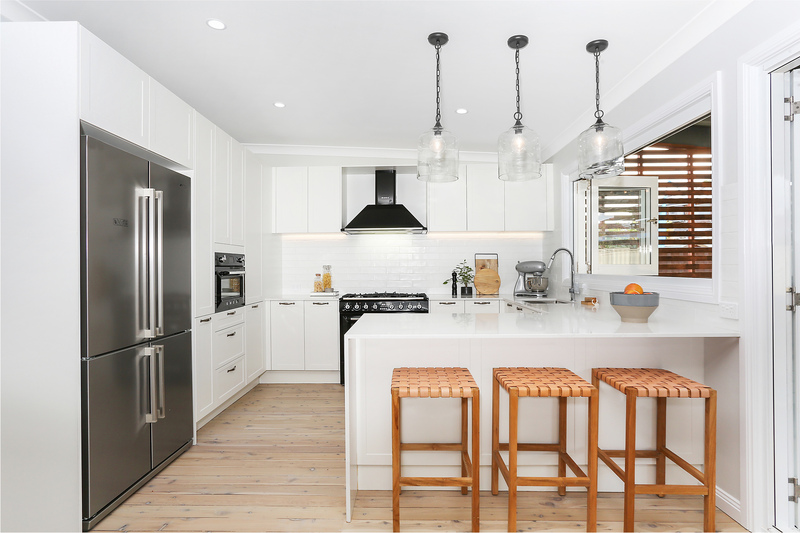 Stylish but low-commitment, both of these elements can also easily be swapped out down the track to give the kitchen a whole new look, without having to change anything else. We can see why this family decided to stay in their abode a little longer – well done once again, Neale Whitaker. 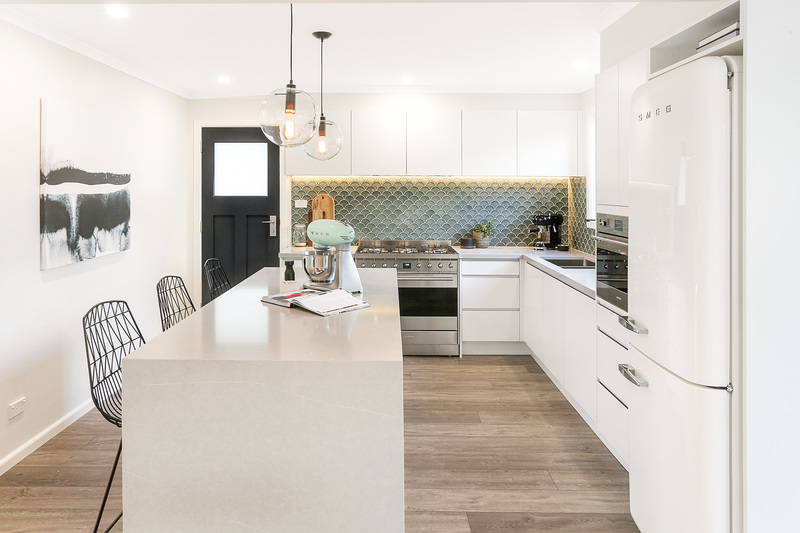 The neutral palette of this Yarrawarrah kitchen renovation has been lifted with some soothing colour, in the form of sage green mermaid tiles for the splashback. The choice of retro appliances injects further personality, along with statement stools. 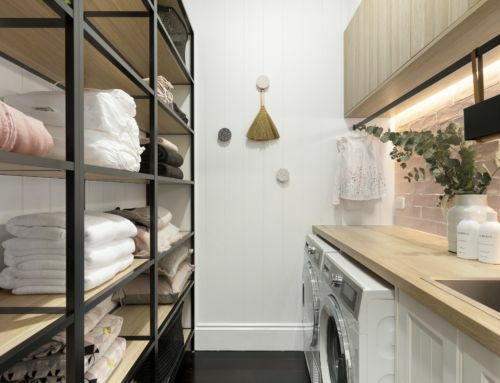 The Essendon White Satin cabinetry is simple and streamlined, working in harmony with the subtle grey shade of the Silestone Serena benchtops. This is yet another kitchen that saw Neale Whitaker win the battle to have the owners ‘love it’ rather than ‘list it’. 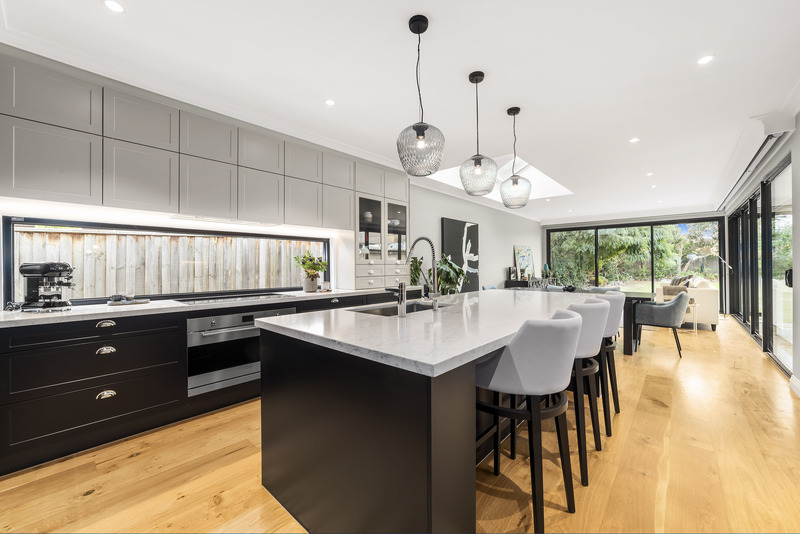 This stunning open plan kitchen located in Preston, Victoria showcases the best of modern kitchen design, creating the ultimate living and entertaining space. Their Kinsman Kitchen features a floor-to-ceiling wall of Somersby Stone Grey cabinetry contrasted by an adjacent wall in Somersby Black Matt. While showcasing a contemporary shaker style, this kitchen also includes glass display cabinets and chrome cup handles as a nod to a traditional kitchen design. The large island benchtop is in Silestone Pearl Jasmine and features a stainless steel undermount sink and gooseneck tap, keeping the working space convenient and social. Another win for Neale Whitaker, as the owners couldn’t bear to leave this home after seeing the amazing makeover. 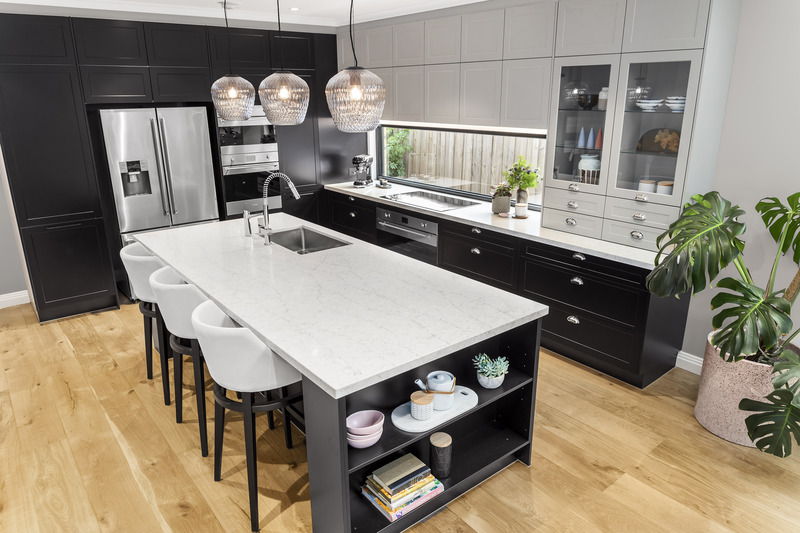 Don’t forget – if you’d like to WIN a Kinsman Kitchen makeover of your own valued at $20,000, don’t miss out on entering the competition on Lifestyle– click here to enter.